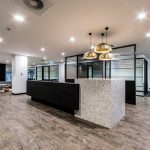 IA Design was engaged by Blackwall Legal to deliver their new fitout within 140 St Georges Terrace. 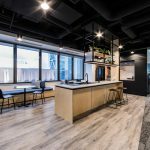 IA Design has considerable experience within the 140 St Georges Terrace building and is well acquainted with extracting maximum return from this buildings floorplate. This intimate knowledge was greatly received during the design and construction of this fitout. The brief was to develop a traditional legal firm look and feel for the specified areas of the interior. The desire for the front of house area was to develop a unique space that was open and welcoming. Another requirement was for the branding of the company to be evident throughout the fitout. The brief placed a lot of emphasis upon the selection of furniture. IA Design visited showrooms with the client to ensure they could test out each piece of furniture to ensure they were satisfied with the final selections. The final selected pieces had long lead times and as a result the design team had to be very transparent about the pieces not arriving in time for practical completion. The client was made fully aware of this and through good communication no issues were to arise. The final office fitout is a well-designed office space with quality finishes that reflect the depth of the business and what they represent.